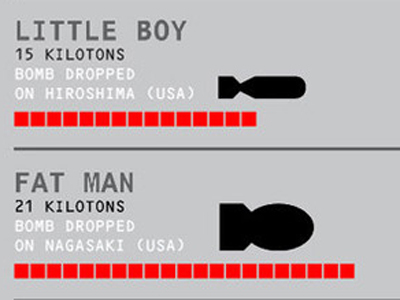 In 194 5 nuclear bombs were dropped on the Japanese cities of Hiroshima and Nagasaki, killing about 212,000 men, women, and children. This year, 72 years later, we have a historic opportunity as the great majority of United Nations members have developed a treaty to ban all nuclear weapons. This is particularly important since the improved missile systems developed under the Obama Modernisation Program and being escalated by Trump are now capable of instantly wiping out the Russian deterrent. All our hopes and plans for the future exist under the shadow of a catastrophic threat that could kill millions of people and destroy planet Earth. Although there are other threats, such as global warming, nuclear weapons are the greatest immediate danger confronting our species. To our shame, the Australian Government has boycotted the historic UN talks. 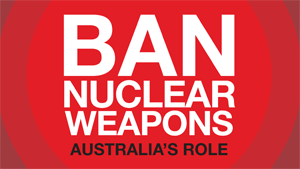 But 84 percent of Australians want the government to support these efforts to ban nuclear weapons. Australia has joined treaties banning chemical and biological weapons, landmines and cluster munitions. Now it must help negotiate a Nuclear Weapons Convention. Australia lends bases, ports, and infrastructure for the United States nuclear war-fighting apparatus. 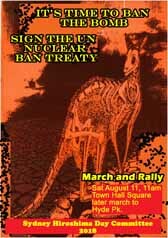 Australia’s boycott calls into question our commitment not only to the UN but also to the 1968 nuclear non-proliferation treaty which obliges all member states to “pursue negotiations in good faith on effective measures relating to … nuclear disarmament”. Who will believe government claims to want peace and security if Australia actively undermines this historic effort?